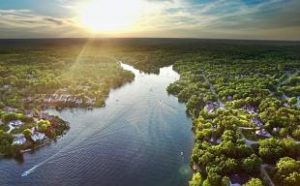 Nestled in the rolling woodlands of southeast Indiana just 30 minutes west of Cincinnati, the private community of Hidden Valley Lake offers a unique blend of small town charm and big city access. 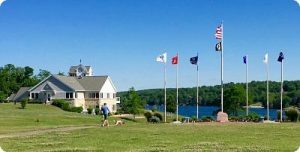 The 150-acre lake, 6 smaller lakes, 18-hole golf course, athletic fields, pool complex, sandy beach, restaurant & bar, and more provide abundant recreation opportunities. Originally planned in the early 1970s as a weekend getaway, Hidden Valley Lake has grown into a vibrant residential community of approximately 5500. Acres of wooded greenbelt surround an interesting diversity of home styles, ranging from rustic to traditional to contemporary. Wildlife sitings are frequent, including deer, turkey, geese, ducks, and even the occasional eagle or fox. Residents enjoy peace of mind knowing that a security force of Dearborn County reserve deputies provides 24-hour service to the community. Located in Dearborn County, Indiana, Hidden Valley Lake is bordered to the south by the city of Greendale and to the east by the Ohio/Indiana state line. The postal address is Lawrenceburg, IN. Quick access to I-275, linking to I-74 and I-75, provides easy commuting to the Greater Cincinnati and Northern Kentucky area. Downtown Cincinnati is 24 miles east and the Northern Kentucky/Greater Cincinnati Airport lies 20 miles south. 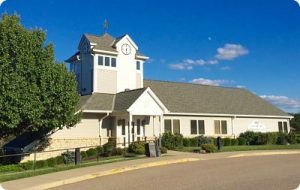 Built in 2007 overlooking beautiful Hidden Valley Lake, the Community Center houses the HVL Property Owner’s Association Office. Conveniently located near Willie’s Sports Café, the Sports Complex and the Veterans’ Memorial, the Center is the hub of the community. The multi-use facility includes the Fitness Center and a spacious Community Room on the lower level. Featuring an outdoor patio, ample parking and handicap access, the facility is ideal for meetings, events and social activities. POA members may reserve the Community Room for birthdays, showers, card parties, club meetings, reunions and more. Monday – Saturday 11 a.m. – 2:30 a.m.
Sunday 11 a.m. – 12:30 a.m.
For sports enthusiasts looking for a great meal with a spectacular view – why go anywhere else? 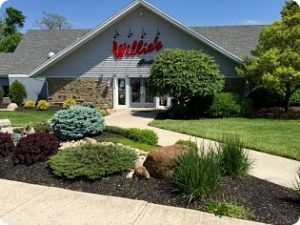 Conveniently located next to the Hidden Valley Lake Community Center, Willie’s Sports Café has the Tri-state’s best Happy Hour. The menu includes wings, pasta, steaks, and much more. Enjoying a great day boating on the lake? Tie up at Willie’s boat dock and come on in for a great meal. Dine indoors or out on the spacious deck overlooking the lake. Bring your laptop with you and enjoy free Wi-Fi Internet Access. Sign up for sand volleyball. Willie’s also offers banquet facilities that can accommodate nearly any size party for nearly any type of affair. Whether it’s a business meeting or a rehearsal dinner, let Willie’s do the cooking. Don’t miss the classic car shows at Willie’s during the summer months. Check the calendar for dates and times. The Hidden Valley Lake community honors veterans with a Veterans’ Memorial located on Alpine Drive across from the Community Center. This is the site each year of a Memorial Day ceremony to remember and honor all veterans. Overlooking the main lake, the memorial features flags representing various branches of the military. At the base of the flags are benches and a landscaped area paved with personalized memorial bricks. Residents may purchase bricks inscribed in honor of veterans – family members or friends – as a lasting tribute to loved ones who have served their country. Everyone wants to know that they live in a safe place! It provides a sense of comfort and security. Hidden Valley Lake is one of the safest towns in the entire state of Indiana as well as the Greater Cincinnati area. • Ranked #15 overall by Cincy Magazine (June/July 2016), Top 50 Communities in Greater Cincinnati. • 1970 – Developer James Rupel planned HVL as a recreational weekend getaway. The original plat contained 300 lots. To create the Hidden Valley Lake, an earthen dam was built on Doublelick Run, a small stream flowing southeast to the Ohio River. It is is the deepest man-made lake in Indiana, with the second largest earthen dam. • 1972 – with the addition of more acreage, the number of lots increased to 2,355 with 25 homes built. • 1979 – The completion of the Indiana portion of the I-275 circle freeway provided convenient access to HVL from the Cincinnati area, spurring development. • 1980s – HVL gradually began changing from predominately weekend homes to a mostly residential community. 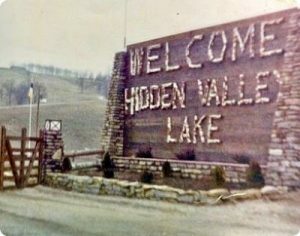 • 1987 – The Hidden Valley lake Property Owners Association took over management from the developer. • 1990s – A building boom saw an average of 84 homes built per year. The number of lots increased to 3229. • Compacted fill – 1,212, 890 cu. yds. • Rock excavation – 179,845 cu. yds.